“I was just telling her at breakfast how much I was in love with her now just as much as when I met her,” said Leo Goldner. 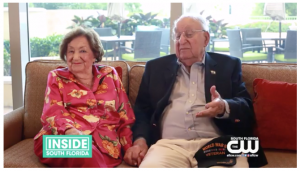 Leo and Marian Goldner were just teenagers when they met back in 1940. Fast forward 8 decades and the two are getting ready to celebrate their 76th wedding anniversary. 95 year old Leo is a World War II combat veteran who created a successful business with $100 to his name. 96 year old Marian is a dedicated mother, grandmother and an accomplished writer. “I tell her I love her, don’t I,” said Leo. First, affection. From kind embraces to kind words. Their second tip is more of a luxury than a requirement: separate bathrooms. “Most of our marriage we have had separate bathrooms fortunately. There might have been some more fights if we didn’t have them,” said Marian. Lastly, “live a manageable life.” For the Goldners it meant moving to the Vi, a retirement community, where they could focus on each other. For full article and video click here.